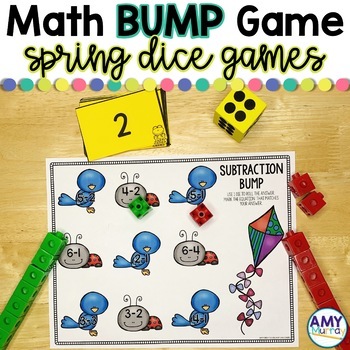 These bump math game boards are the perfect guided math center for the spring season. 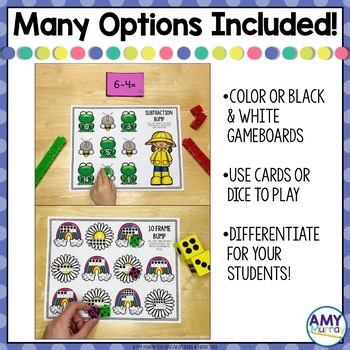 These fun math dice games for kindergarten students are the perfect center choice. Bump is a low-prep, highly engaging roll and cover game to include in your math centers during guided math instruction. It only takes a few minutes to introduce the game bump to your students. Once they know how to play, you can use the basic game premise to practice an endless amount of skills! Students will love practicing adding, subtracting, subitizing and more math skills while trying to "bump" the other players off the board. 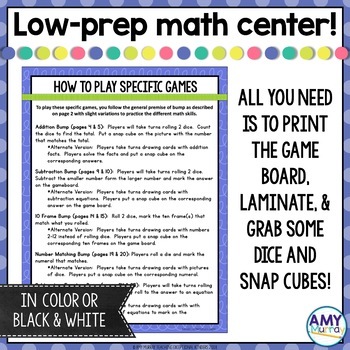 Save yourself time with this low-prep center activity! To play bump, you will need to print the game boards, get a set of 10 snap cubes or some kind of marker for each player and you will decide if you will play with dice or print the included game cards. ➜ Please contact me with any questions or concerns at TeachingExceptionalKinders@gmail.com.